Additional dividend growth powers our stocks higher. Other investors see their already-generous yields rising even higher and pay more for our shares. Our savvy bond managers can generate returns in excess of our dividends. When they do, their fund’s NAV (net asset value) rises and its price usually follows. We typically buy stock and bond funds when they trade at a discount to their NAVs. As they swing from being out-of-favor to back in-favor (as often happens) our contrarian buys are rewarded with higher prices. While I can’t share my 20 favorite plays today, thanks to the pullback, there are other compelling high yield “no names” of similar contrarian flavor to consider for payouts plus upside. 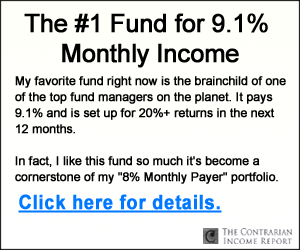 All three boast well-funded dividends that add up to 6% to 8% per year. When you think about high-yield sectors, you probably think utilities, consumer staples and real estate investment trusts (REITs). You probably don’t think about banks, for good reason. Many banks took a scythe to their dividends during the Great Recession, and while they’ve been restoring those payouts ever since, they’re not exactly drowning investors in cash. The yield on the Financial Select Sector SPDR Fund (XLF) is about 2.1%, which is just a hair above the broader market. Needless to say, regional bank Oritani Financial (ORIT) sticks out like a sore thumb in the space with its tiny market cap ($735 million) and gigantic dividend (6.2%). Oritani – headquartered in Washington Township, New Jersey, and features 26 branch locations across four counties – has served its communities for more than a century with various personal and business financial services. Oritani’s dividend has undergone a significant transformation in 2018. 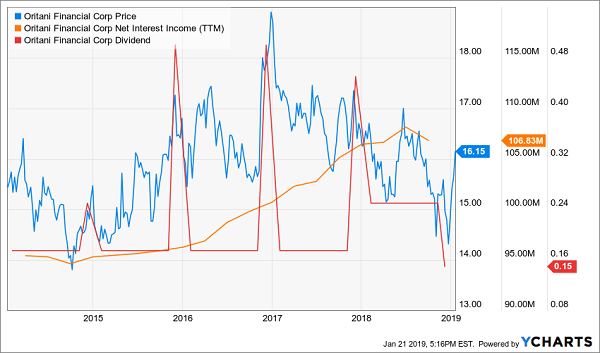 For years, the company paid out a 17.5-cent regular quarterly dividend, then tacked on a significant special dividend at year’s end (45 cents in 2017, 50 cents in 2016, 50 cents in 2015). However, in 2018, the company boosted that regular payout by more than 40% to 25 cents quarterly. Then at the end of the year the firm delivered a much more modest special payout of 15 cents per share. So far, ORIT seems to be in decent straits. Last quarter, for instance, the company managed to improve net income by about 12% year-over-year, though that was in part thanks to the lower income-tax rate. The other thing to note is that Oritani has reported 30 cents per share in profits over the past three quarters. If the final quarter of 2018 plays out the same way, that’s $1.20 in profits with $1.15 (96%!) paid out across regular and special dividends. That’s too tight a window to trust. Let’s move onto a lender with a little more breathing room. 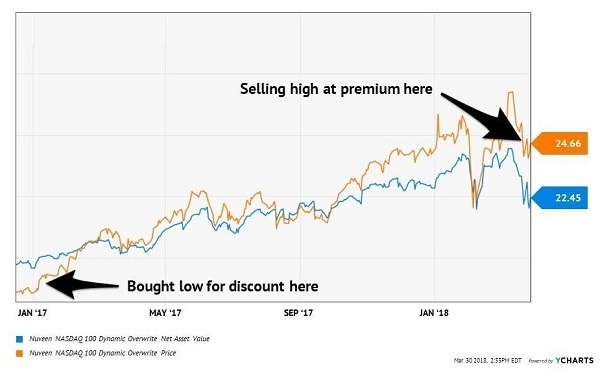 Can Oritani Financial (ORIT) Keep Up With Its High-Flying Dividend? TPG Specialty Lending (TSLX) is a business development company – a type of business that’s designed to provide financing to smaller firms. BDCs are similar to REITs in that they get a pass on federal taxes in exchange for doling out 90% or more of their taxable income to investors, in the form of dividends. TPG Specialty Lending is the direct credit investment platform of private equity outfit TPG. It provides financing to middle-market companies – in industries ranging from IT to energy to education and more – that allow these firms to engage in M&A, restructure or just plain ol’ grow organically. Its deals tend to focus on companies of about $50 million to $1 billion in enterprise value, in transactions ranging from $15 million to $350 million. Its investments range from senior secured loans to mezzanine debt to equity. You likely haven’t heard of this BDC, though you may have heard of some of its clients, which include 99 Cent Only Stores, Eddie Bauer and Staples. Its portfolio also includes the likes of chiropractic software provider Chirotouch; test, measurement and inspection equipment manufacturer Industrial Physics; and prepaid-card solutions firm Swift Gift, which manages cards from the likes of Visa (V) and MasterCard (MA). I highlighted this company along with several other BDCs back in early 2018, citing its strong growth in net interest income (a vital profitability metric for BDCs). Since then, the stock has delivered 17% in total returns (including dividends) versus just more than 1% for the S&P 500. And the fundamental story still looks fantastic. The company’s most recent (third quarter) earnings featured a 5% uptick in NII, and net assets cleared the billion-dollar mark ($1.07 billion, up from $969 million a year ago). Also, about that 8% yield? That’s the minimum you can expect from TPG Specialty Lending. You see, this BDC pays a base 39-cent dividend, but also has OK’d a supplemental dividend every quarter for almost two years now. So based on those payouts, TSLX’s yield actually hovers somewhere between 9% and 10%! 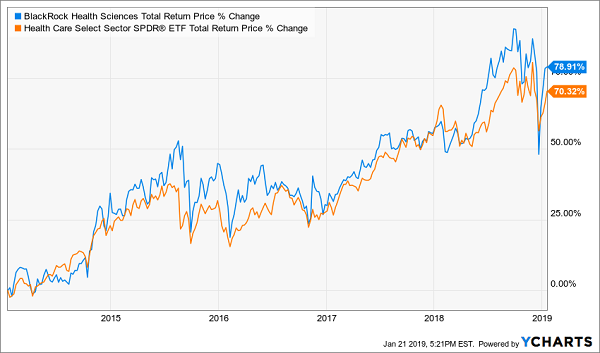 When you think about healthcare funds, a few names probably come to mind: the ETFs like the Health Care Select Sector SPDR Fund (XLV) and SPDR S&P Biotech ETF (XBI), or even mutual funds like Vanguard Health Care (VGHAX) or T. Rowe Price Health Sciences (PRHSX). But investors have a tendency to overlook closed-end funds, and that’s a shame. Wall Street’s sea change toward dirt-cheap index funds has turned many investors completely off of more expensive actively managed products, such as CEFs. But in some cases, management earns those extra costs. The BlackRock Health Sciences Trust (BME) is a broad-based, primarily large-cap healthcare sector CEF that is made up of pharmaceutical, biotech, life sciences, healthcare equipment, insurance and health services companies. Top holdings such as UnitedHealth Group (UNH), Pfizer (PFE) and Abbott Laboratories (ABT) can be found among XLV’s biggest weights, too, though there are a few significant differences. The one that stands out the most is a small roughly 2% weighting in troubled Johnson & Johnson (JNJ), versus a 10%-plus allocation in the XLV because of its massive market capitalization. The difference-maker for BME is that management also writes (sells) options to juice its dividend yield. The result? A 10-year average annual total return of 16.99% – 177 basis points better than the XLV. It’s been particularly good over the past year, up about 13% to the XLV’s 3.5%. Throwing your money at overvalued stocks in the S&P 500 is a one-way ticket to retirement poverty. Not only will your shares have limited upside potential because Wall Street has already driven up the price to historically high levels, but you’ll be collecting just 2% in annual yields on average. That means if you’ve saved up a $1 million nest egg, you’ll still only be earning $20,000 a year in dividend interest. What kind of retirement do you think $20,000 a year buys you? You need more than that. A lot more. 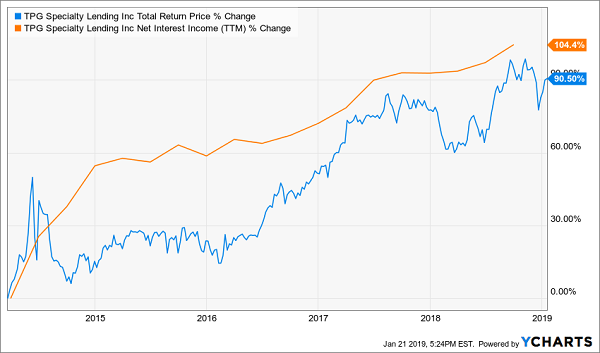 Not just more income, but more everything – dividend growth to beat back inflation and make sure that the yield on your portfolio doesn’t decay over time, not to mention capital appreciation to keep building your nest egg. I’ve read a host of analyst recommendations for the year ahead, and I can’t tell you how many of the same old tired blue-chip stocks – recommend year-in and year out – that I’ve seen. I did a quick analysis of one “pro” set of picks and calculated just 4% total return potential based on dividends and share appreciation from paltry estimated earnings growth. That kind of return will have you bleeding your nest egg dry to survive after just a few years off the job. You worked too hard for decades just to struggle financially in your golden years. 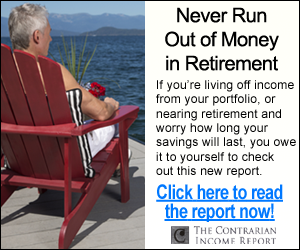 Let me show you how to secure the comfortable retirement you’ve worked your tail off to enjoy. 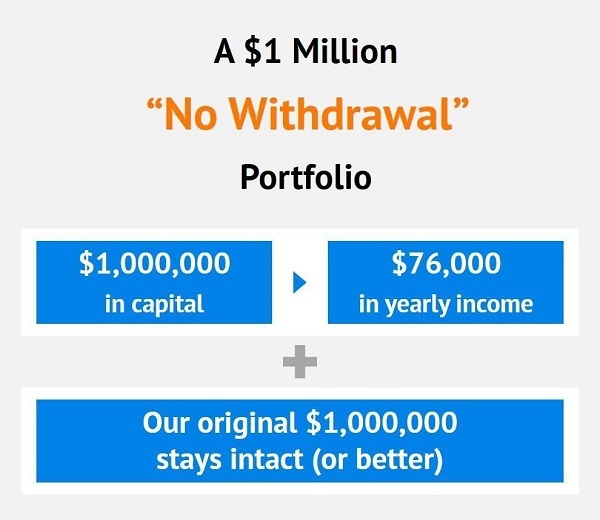 Click here for THREE special reports that show you how to build this “No Withdrawal” portfolio. You’ll get the names, tickers, buy prices and full analysis of their wealth-building potential – and it’s absolutely FREE!